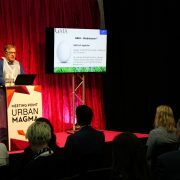 GAIA BioMaterials founder Åke Rosen was invited to present at Meeting Point Urban Magma, an annually re-occurring meeting place about the challenges cities face within energy, eco-system services, water and waste management; especially the tools necessary to solve these challenges. 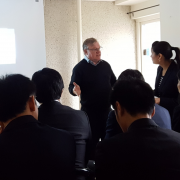 During his presentation, which was held together with Louise Strand, Purchasing Director at Region Skåne, Mr. Rosén spoke about the insights gained from having been part of a public innovation procurement process. 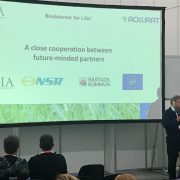 Mr. Rosén also presented the company’s revolutionary biodegradable biomaterial Biodolomer® and how it can help close the loop for the circular economy through the efforts undertaken within Biodolomer® for LIFE; an EU financed project within the LIFE program that is undertaken together with Båstads Kommun and NSR AB. More than 60 members of the general public, public officials, business people and academia. The Annual Conference Recycling day the 17th of May in Helsingborg. NSR AB opens the facility for environmental solutions that can contribute to a sustainable future and Vera Park is a cluster of environmental technology based in northwestern Skåne. About 155 persons from the waste and recycling business area in Sweden participated at the conference and mini-fair called Recyclingdagen. 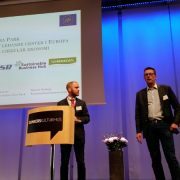 Martin Dyberg, Strategic Communicator at Vera Park and Dusan Raicevic, Business Developer at Vera Park, held a presentation about Vera Park – concept, companies and Projects within it, such as Biodolomer® for Life. At the stand they showed up Gaia´s products and its partnership at Life Programme together with NSR AB, and Båstad Municipality. As well as other Vera Park companies products and services. 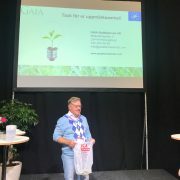 On May 16th Åke Rosén, founder of GAIA BioMaterials, was invited to make a presentation to Avfall Sverige´s (Waste Management Sweden) Pouch Project. Reason for this request was that GAIA´s unique biodegradable and compostable biomaterial Biodolomer® is currently evaluated in a Pilot Project run by NSR and HelsingborgsHem. 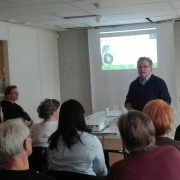 At this presentation Mr Rosén presented the advantages of using Biodolomer® food waste bags compared to paper bags. One of the major differences is that the GAIA bags show considerably lower bacterial and fungal formation on the outside of the bag. The GAIA biomaterial food waste bags Pilot Project is part of the “Biodolomer® for Life!” project – an EU-financed project within the LIFE program – which aims to investigate and develop the business opportunities for products made by the Biodolomer® material from a circular economy perspective. The Pouch Project aims to identify which qualities a food waste bag has to incorporate, as well as increase the understanding of food waste collection and treatment chains, as this will influence the requirements on waste bags in order to present a bag that not only meet these requirements, but also meets all environmental goals. Inform about Life programme and its 25 th Anniversary. 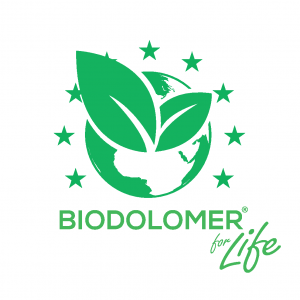 Inform visitors about Biodolomer® for Life project and how the project members interests line up within the project from the circular economy perspective. Spread information about how biodegradable biomaterails: are made, differ from traditional plastics, differ from non-degradable biomaterials, can be used for a wide range of various applications, can replace traditional plastics. Target Groups: local council officials, potential local business partners, public, primarily school children, press and media. On May 31st, GAIA BioMaterials hosted a viist from Tropikhattarna (the “Tropics Hats”) as part of the corporate safari organized in conjunction with Skåne Innovation Week. During the visit, participants were given a closer look at the production process and were also given the opportunity to ask GAIA staff questions and to inspect the products more closely. 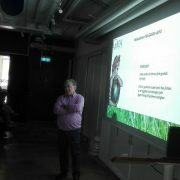 Earlier in the day, Åke Rosén had held a presentation for the Tropics Hats down at Mindpark’s office in Helsingborg, where he spoke about GAIA BioMaterial’s history, what makes the company’s patented biomaterial Biodolomer® unique, and about Biodolomer® for Life; The EU-sponsored project in the LIFE program, which GAIA runs together with NSR and Båstad Kommun. On Thursday May 11, GAIA BioMaterials welcomed a delegation from the Japan Packaging Institute, JPI. During their visit, the founder of GAIA BioMaterials, Åke Rosén, introduced them to the company’s patented unique biomaterial Biodolomer®, the development in biomaterials and the circular economy. The visit was arranged by Packbridge, the international network cluster within packaging solutions. GAIA BioMaterials would like thank our guests from the Japan Packaging Institute and Packbridge for paying us a visit and hope that they considered it time well spent. During Friday April 21st, a delegation from Region Skåne, the Regional Public Healthcare provider, visited GAIA BioMaterials for a presentation about the development within biomaterials and the circular economy, as well as learning more about the aprons made from biomaterial that Region Skåne has ordered from the company. 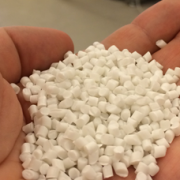 Båstad Municipality and NSR, focusing on the company’s unique and patented material Biodolomer®, a compostable and biologically degradable biomaterial. The visit ended with a tour of the production hall, where the visitors were given the opportunity to experience the process from raw material to finished aprons. GAIA BioMaterials would like to thank our guests from Region Skåne, hoping they found it as interesting as we did. 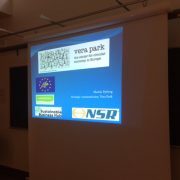 At a lecture at Chemistry Center in Lund on April 7th 2017, Martin Dyberg, Strategic Communicator at NSR AB and Vera Park, presented the Vera Park concept, as well as the member companies, including Gaia Biomaterials AB. On March 30th, Gaia BioMaterials CTO Åke Rosén R&D and CEO Peter Stenström were invited to the furniture fair PROMATAP in Łódź, Poland, to present the future for bioplastics within the furniture industry from an environmental and sustainability perspective. The seminar was hosted by Ackurat, a leading European manufacturer of plastic components to the furniture industry. Gaia’s view of the circular economy, where reduced waste of natural resources and recycling of products into renewable energy are cornerstones, as well as its work with developing a new biomaterial together with Båstad Municipality and NSR as part of EU’s LIFE programme, was very well received by the audience.